When a JRPG promises curry, magic and dungeon crawling, it's hard to know whether to expect a light appetizer or a full course meal, game content-wise. So imagine my great surprise when this humorous and charming yet punishing JRPG managed to frequently amuse me with it's silly humour all while challenging me in its tough roguelike dungeons. 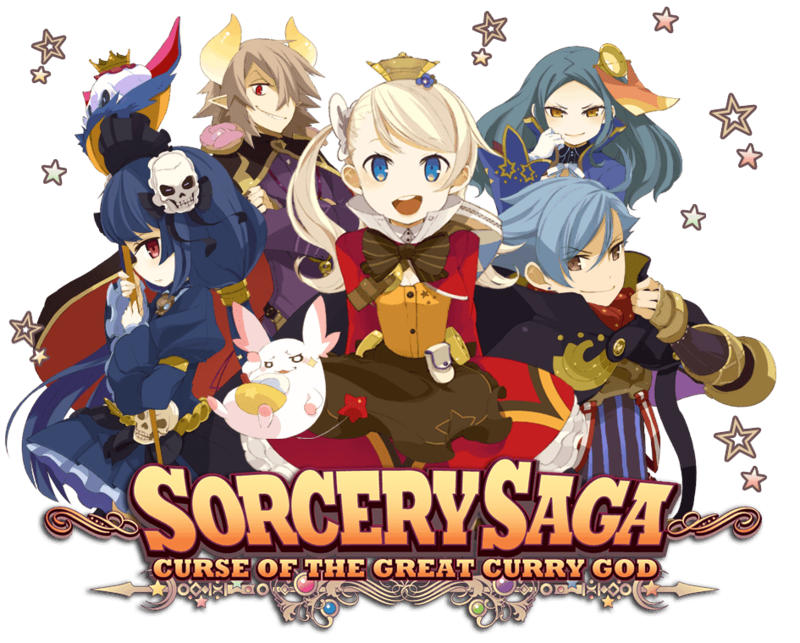 With plenty of banter and a whole lot of silliness mixed with dungeons ready to challenge even the best dungeon crawlers, Sorcery Saga: Curse of the Great Curry God is a charismatic, engaging change from the serious side of JRPGs that balances humour and good gameplay admirably. Sorcery Saga’s story is based around Pupuru, a sweet and spunky student of a Magic Academy who just so happens to love curry. She’s not an A-grade student, but thanks to some luck she gets to go on a quest for her school, where she finds Kuu, a funny creature that eats pretty much everything, and an ancient curry recipe. When she fails her quest and finds herself suspended from school, she decides to spend her time helping her friend’s curry store by promising to make the Legendary Magic Curry. Pupuru’s journey is not a serious one; it's a colourful tale populated by quirky characters, including a love sick prince, an unintentionally creepy wizard and a group of young wannabe heroes named Udon, Panna and Naan. Despite repeating a lot of the same jokes and letting banter go on a little too long, the humourous script is very well-written and really creates a lively feel throughout the entire 30 hour long story. I found myself genuinely laughing out loud on multiple occasions and because the dialogue is so engaging, long dialogues are easy to overlook as the script really keeps things amusing. Heavily contrasting the lighthearted story are the punishing Roguelike dungeons that are the core gameplay of Sorcery Saga. If you’re like me and had never played a Roguelike before, it differs from regular dungeon crawlers because your character always starts at Level 1 in each dungeon, no matter how much you grinded in the previous one and if you get a game over, you have the extra tax of losing most of your items to deal with. This means being smart about planning how you’ll make your way through the dungeon rather than leveling as high as you can to overpower enemies. 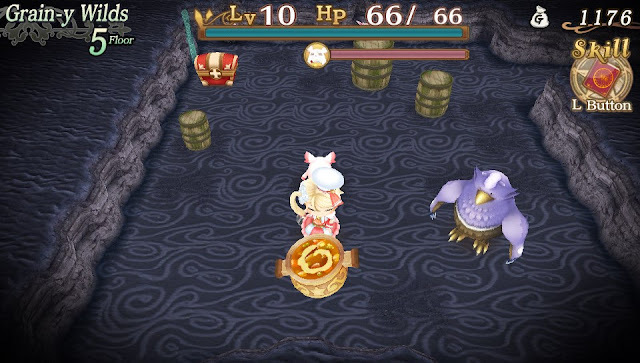 You can hoard and enhance equipment to make your dungeon crawl easier, which is important since it seems Sorcery Saga wants to make things as hard as possible. There are traps to look out for, Monster Houses where you get suddenly surrounded and items with seemingly intentionally vague descriptions that mean you only know what they do when you try them, and sometimes that means Game Over. 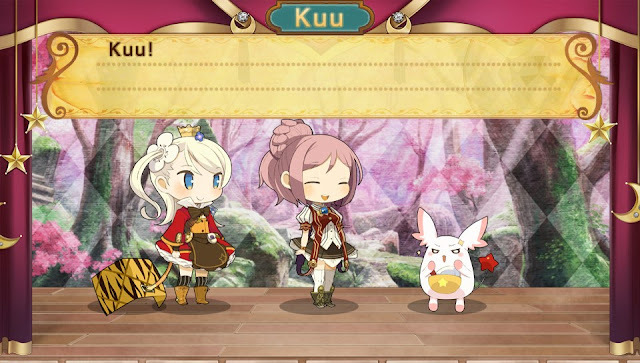 Even your helpful pet Kuu can be hit or miss, as his AI means he will either jump in front of you and protect you from an enemy or run in another direction just for fun. Despite Sorcery Saga’s harsh nature, I actually found myself enjoying the challenge after a rocky learning curve that lasted a few chapters. Winning a dungeon is very much about choosing which risks to take, such as grinding on a floor and risking dungeon collapse or considering the chances of your final hit defeating an enemy when their next hit could kill you. It's about using stat boosts, such as the Curry On Demand mechanic where combining three ingredients creates one of many energising curries, at the time it will benefit you most to smartly get to the final floor safely. While some Game Overs may feel rather harsh, such as trying a new scroll only to have it put your own health to zero on the 11th floor, victories feel well earned and like you faced a true test of strength and strategy in the randomly generated dungeons. If you're having a hard time dungeon crawling, players can take a break by watching extra moments with the cast in the library. 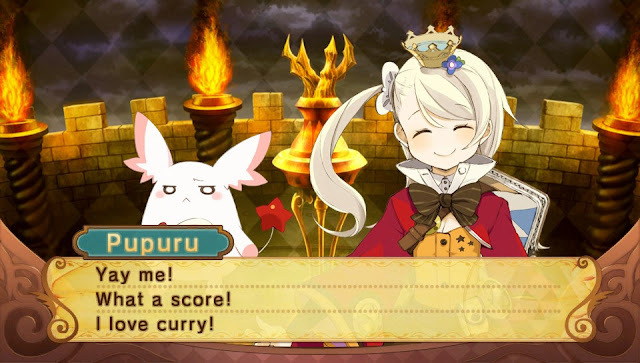 Since Sorcery Saga’s dungeons can be an intense and sometimes long experience, watching fun, extra banter with Pupuru and friends is a nice way to break up the experience. These dialogues aren't essential to the main story and tend to ramble on a little, but are a nice addition for those wanting more time with Pupuru and friends, or for those who like unlocking items going for the platinum trophy. There are also rewards given for collecting items and fulfilling certain requirements such as clearing a dungeon 15+ times, along with a huge bonus dungeon towards the end of the story for completionists and while I don't feel mentally strong enough to go through these at the moment, I appreciate having a reason to go back to Sorcery Saga if I want to. Sorcery Saga’s randomised Roguelike dungeons and fun characters are its best strength and create a charming environment to get totally destroyed in, one dungeon at a time. The great script made me weirdly invested in its quirky characters and the grueling roguelike dungeons were an interesting new way to dungeon crawl, albeit if I met a lot of Game Over screens before understanding how to win sometimes against the odds given. 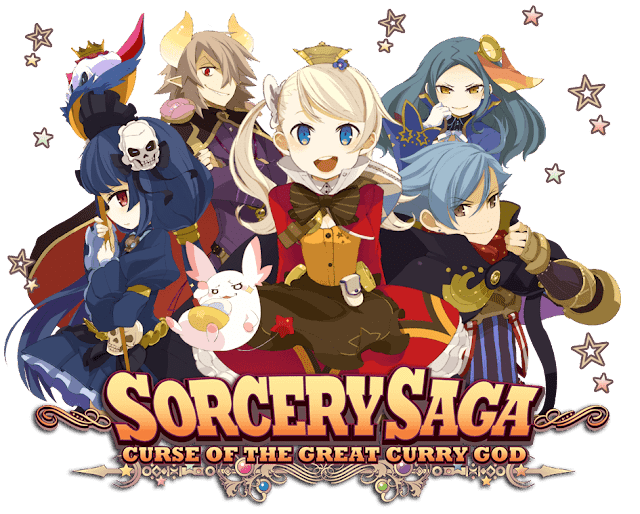 For dungeon crawling fans looking for something light in story but challenging where it counts, Sorcery Saga: Curse of the Great Curry God left a satisfying taste in my mouth and was a great challenge to enjoy next to a fun narrative. This surprisingly challenging Roguelike dungeon crawler partnered with its fun, lighthearted story really amused me in its 30 hour long campaign. While it sometimes punished me a little harshly, winning a dungeon has never felt so rewarding and I've found myself missing it now that it's done. You can pick up Sorcery Saga: Curse of the Great Curry God for PS Vita at Play-Asia.com! What do you think of Sorcery Saga? What's your favourite Roguelike JRPG?